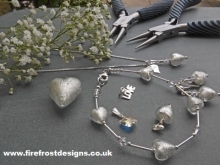 At Firefrost we love designing and making wedding jewellery. The romantic association with Venice makes Firefrost jewellery perfect for weddings and anniversaries. 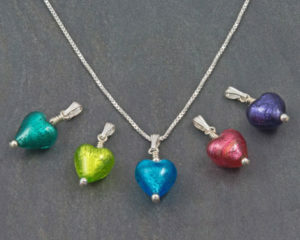 We have a great range of hearts in a fabulous range of colours that we can use to make pendants, earrings and necklaces. The photo on the left shows our lovely Bellina pendants that are available in 10 beautiful colours, perfect for Bridesmaids. We have matching earrings in different lengths from our short Small Heart Earrings to our longer Heart Duo Earrings . We can make these in lots of different colour combinations to match your wedding colours. We can also make special one off designs just for you on your special occasion to match your wedding colour scheme. You don’t have to have hearts. Our Carina Duo earrings are a popular choice or for something shorter maybe our Carina Short earrings? Here are a few other designs which we have done for weddings in the past, and remember you can have these in any of our colours. If you would like to you are welcome to arrange to visit us at our studio, bring any colour samples you have and we can work with you to design something bespoke for you for your special day. Firefrost jewellery is designed and handmade in the UK. We use Murano Glass from Venice, Sterling Silver, Swarovski Crystals and other lovely beads.